The Audi A8 series with its eight cylinder 4.2 299 HP engine was perceived as cutting-edge technology. This engine has been used in lots of larger cars of the VW-Group. Our article is about troubleshooting an intermittent fault bothering the above mentioned engine and its owner. Luxury cars built in the nineties are easily affordable nowadays. Their low prices seem to be really seductive: possessing a large car with that engine power and comfort is a deal nobody should miss. Or should they? According to the owner, the vehicle hesitated briefly when he wanted to start after a short idling. After passing a certain speed (about 20 km/h) the jerking ceased and the car behaved normally again. Plenty of sensors and actuators had already been swapped, replaced or tested, including spark plugs, fuel pump, fuel filter, air mass meter and oxygen sensors. As more garages had failed to fix the problem we received the honor being the last chance in resolving the case. Unfortunately the intermittent nature of a fault usually means an unpredictable prevalence of the abnormal behaviour. In our case the hesitation occurred about ten times per hour, sometimes more often, but sometimes just once per hour. Regarding the frequency of occurrence in such a case, the troubleshooting can easily last for days. In fact, none of us thought that it would last for almost a month. In a diagnostic process, the first step is always a compression test. All values seemed to be sufficient, representing good news for our client, but it did not carry us forward. As lots of garages had tried to fix the problem, they all had faced the situation of having no diagnostic trouble codes at all. No stored fault could be found even by us. The only thing that seemed to be sure was that misfiring occurred in one or more cylinders. Knowing ignition coils fail quite often, we tried to replace them against a new one. Replacing the ignition coils sequentially did not lead us to success. At this point we realized that fixing this fault would not be as easy as we had thought. So we decided to continue troubleshooting with our 4-channel oscilloscope. Applying a current clamp simplifies a diagnostic process significantly, especially when having eight cylinders to pay attention to. So we connected the current clamp to the output lines of the ignition control modules. A dropout from the primary ignition control pulses could cause such a malfunction. However, observing the ignition current pulses did not show any dropouts. Instead, when connecting the current clamp to the eight injection control wires, we found a significant outage of about 100 milisecs, identified as the reason of the jerking. However, we still had to find a reason for the missing injection pulses. Therefore our following tests focused on the relevant input and output signals of the engine control module. It is quite unusual to find that injection pulses are missing while the corresponding ignition signals are present. We checked crankshaft and camshaft position signals, earth and voltage supplies, air mass meter, throttle position sensor, idle switch, knock sensors and all other connections that could cause such a dropout. These tests were unsuccessful, thus leading us forward to proclaim the ECM as the prime suspect. 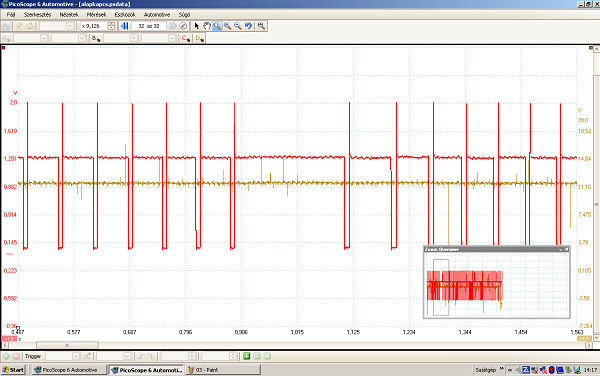 The oscilloscope trace above shows the lack of injection pulses, while the idle switch remains in partial load position. After summarizing all the information we gathered, we decided to try another ECM. After all, it seemed that the ECM forgot about injecting despite all the necessary signals. Our client succeeded to find another ECM in a few days. We connected that ECM to the wiring and set out for a long testing. Unfortunately the fault reappeared with the new ECM again. So there we stood with a new ECM but without any ideas to go on with. However, as we are a kind of a persistent team, and we do not like to give up such an interesting task just in the middle, we set out again, from the beginning. We re-checked every single cable, sensor, relay, swapped ignition coils and modules in pairs, disconnected all unnecessary items and captured hundreds of oscilloscope traces. Not a single abnormality was revealed. We even disconnected additional systems, such as ABS and automatic gearbox to ensure that the fault was not a result of an external request. On the third week it was time to ask for help or advice. We contacted some of the best-known experts of the field, and one of them suggested that the crankshaft position sensor should be replaced. The idea seemed illogical, but according to our client the fault had evolved after fumbling around the crankshaft position sensor. So we surrendered, ordered a crankshaft sensor, replaced it, but in the end we realized that this idea was also a waste of time and money again. The jerking itself reminded us of the hesitation appearing when an ignition coil is faulty, as a short and rough misfire is a typical sign of erratic sparking. However, all the ignition coils had already been replaced before in vain. Our next idea was an ultimate summarizing of the system components. We traced the whole system diagram on a large sheet to achieve a wider look and went over all the elements that could be relevant to the fault. And finally we found something. We realized that one of the ECM connectors (actually it has five) which only consisted wires of minor importance could be disconnected from the ECM without affecting crucial functions of driveability. So the connector plug was removed and we set out on a long journey again, only to find that the fault disappeared! The mentioned connector consisted mainly communication lines towards ABS, air conditioning, automatic gearbox and instrument panel. Normally none of these systems would request a total lack of injection, and we had already disconnected all of them before in vain. Due to that, we did not have a deeper look in the automatic gearbox wiring during the previous testing processes. Actually, this car has a "Selector lever lock control unit" which does not enable shifting when the brake is not applied. The engine management control unit receives the lever position from the gear selector switch, and sends it to the lock control unit. Eventually we found out that the lock control unit had an intermittent internal short circuit, thus disturbing the ECM, which resulted in that irritating jerking. Since fixing the fault our client has been driving around without experiencing any hesitation. After this four-week tour in the deepness of diagnostics we feel combined. On one hand the well-done job is of course satisfying, on the other hand we think it is baffling that even smaller troubles can evolve in challenges we could face over weeks. Modesty is compulsory in our profession, because even if possessing state of the art technology and highly qualified associates, we can easily come across cases in which we feel like giving it up.